First things first: Marketing 101. You are a small independent publisher looking to revive an unjustly forgotten novelist of the 1930s. Last year you brought out, to appreciations from John Updike on down, a judiciously slim volume of his writings from Hollywood, where he decamped in 1940 after three decades in the dreary tenements of Jewish New York. This year, you decide to re- issue the trio of technically accomplished but dramatically modest Brooklyn novels whose flimsy sales sent him chasing the sunshine in California. Do you publish them separately, none longer than 360 pages? Or, as Black Sparrow Books has done, do you bind all three into a thousand-page homicide of a brick, as likely to draw crowds as a case of the plague? But Black Sparrow's disservice to its profit margin--and to the likelihood that these novels will gather a larger audience now than they did the first time around--is a boon to Daniel Fuchs. For the novels must be read in rapid succession, as they describe, in a devastating and implacable arc, a young writer's passage from the vast hope of youth through the disillusionment of knowledge to acringing disgust with the violence of a low world. They should be required reading for any contemporary downtown Jewish hipster waxing sentimental about what bubbe and zayde were up to on the Lower East Side. Fuchs, who died in 1993, was born in 1909 on Rivington Street, now the heart of that neighborhood's rebirth, in those days home to endless rows of sweaty, cramped tenements. Five years later, after an interlude in eastern Brooklyn, the Fuchses moved to Williamsburg, across the East River from the Lower East Side. When Fuchs's father, a concessionaire in a Manhattan office building, traveled around the metropolis delivering Christmas-candy orders, young Daniel followed. But Fuchs could never shake the sense that there was no release from Williamsburg. Owing to the Depression or to their own fears, its erstwhile shtetl dwellers slowly succumbed to a dispiriting, incestuous torpor, taking their children--Fuchs's contemporaries--with them. With his three Brooklyn novels--Summer in Williamsburg (1934), Homage to Blenholt (1936), and Low Company (1937), cumulatively a counterhistory to the official triumphant bildungsroman of modern American Jewry--Fuchs would establish himself as the pre-eminent chronicler of this malaise. His fatalism about the Brooklyn fate grew greater with each novel, and, like an invention of the Greeks, he escaped to California before he was consumed by the slow fire of his own insight. Summer in Williamsburg opens with Meyer Sussman, the neighborhood butcher, taking gas through a basketball bladder connected to a gas pipe. This unexplainable death--the butcher had been successful and happy in marriage--sends twenty-year-old Philip Hayman, an aspiring writer, reeling: "When you meet God, Meyer Sussman, ask Him for me what made you squeeze the basketball bladder over yourface. Little God in Heaven, sitting somewhere on a cloud, where are You?" Philip--who hardly knows what the world around him means, let alone how that meaning could disappoint enough to drive someone to suicide--turns to Old Miller, a neighbor who recites prayers over graves for pocket change at a nearby cemetery. "You must make alaboratory out of Williamsburg to find out what touched [Sussman]here," Old Miller tells him. "You must pick Williamsburg to pieces until you have them all spread out on your table before you, a dictionary of Williamsburg. And then select. Pick and discard." Inland the tenements seemed abandoned and resembled for the day ruins of an early time. On summer weekdays and nights there were always hundreds of people thronging the streets and a constant flow of traffic. The emptiness now took on all a stranger significanc eby contrast. The grocery and butcher stores, closed by municipal law, had their green blinds drawn in front of their windows. A candy store here and there dozed in the mid-afternoon heat until the subways restored its customers. A pair of ice picks, hanging neglected over the iron railing of a tenement basement, indicated that here at other times Italian icemen did a noisy, open-air business. A few sleepy cats nosed deliberately in cans of garbage for scraps. An old woman shuffled down the street, and this completed the effect of lifelessness. Such observations read less like a novel than a dutiful transcript of sketches for one--a nifty animation of an unseasoned writer like Philip. (These passages are also the direct ancestors of the tiresome pages of reportorial description that mar Philip Roth's Newark novels.) Fuchs, who was all of twenty-five when he published the novel, knew better, though Philip does not. This was not the last time that Fuchs would sacrifice the quality of his prose to what he felt was the truth of his art. If Philip takes too much in, still he fails to look very far: most of his questing takes place, at least psychologically, inside Williamsburg, where "things moved in circles, nothing happened." (Though he attends City College, it is the source of no scenes or influences.) The reasons for this remain largely withheld, and thisis frustrating, because Williamsburg--"the garbage cans, the dirty streets, and a wet, hot sun pouring suffocating heat over dark, close rooms"--seems like a place well worth leaving. In Williamsburg--where, hemmed in by Irish and Italian gangs, Fuchs grew up in "fear that possessed and constricted us," as he wrote tothe critic Gabriel Miller--the options are stark. There is Mr. Hayman, Philip's father, an Old Worlder so aggrieved by America'scrass commercialism that he wants only "a cigarette and a window,"an "isolation to protect himself" from further reminders of theplace he has chosen to live out his days. (Like Fuchs's father, hesells newspapers in a Manhattan skyscraper.) On the other side isPhilip's maternal uncle Papravel, the boss of a ring of small-time thugs who have been hired by a local bus-line owner to squeeze outa competitor, which he manages with both efficacy and ingenuity. "There was the choice ... Papravel or his father. Papravel, smoking cigars, piled up money and glowed with sweat and happiness, while his father sat with his feet on the windowsill in the dimness of a Williamsburg flat." Philip understands that his father is a tragic anachronism, but he cannot help "respect[ing] so deeply this man who, with no bitterness of spirit but rather with still faithful obedience to his principles, accepted his fortune and minded notthat it was bad." Tender toward Philip, the man is one of Yiddish literature's heroic endurers, the saint of a different place and time. In America, he can give his son little more than the self-pity of nostalgia. Philip has a fellow searcher in his friend Cohen, so archetypal in his romantic howls at the heavens that he is not even given a first name. Cohen is sufficiently self-conscious to find Williamsburg stifling, but not intelligent enough to see through self-importance or resist self-pity: "Cohen felt acutely a personal divinity and itwas a source of considerable inner distress. Consequently, he spokewith just enough trace of quiet fine suffering, of the beauty, poetry, and poignant pathos of existence." In gusts of yearning, Cohen adopts and discards laughable poses--an urbane movie star, a brawler in a melee on the beach, a member of the Communist Party--and Fuchs skewers him heartlessly, down to his repugnant appearance: "He was ugly with his pimples. His hair was thin, and he had to oil it and plaster it over the bald spots." These days, a figure such as Cohen might seem bold for warding off the compromises of adulthood until he knows himself fully, whatever pretensions this may require. But in Fuchs's setting, he is aschlemiel. No, worse: Cohen dares to ignore the gruesome choice--Mr. Hayman or Uncle Papravel--that Williamsburg imposes on all its inhabitants, and the author dispatches him in a tenement fire. Philip proudly resists Cohen's indulgence, preferring what heimagines to be an undeluded realism. If there is no way out of Williamsburg, at least he won't sugarcoat his destiny. But inpractice, this means that he stifles himself. He chides himself forbeing too revealing about his uncertainties in a letter to awealthier friend, and when a neighborhood girl named Tessie, who spurned Philip to marry a more stable prospect, decides that she is unhappy and makes overtures to Philip, he derides her for failing to keep her bargain. In Philip-- who seems unable to imagine a rejection of his father and Papravel both--Mr. Hayman's mournful quiescence becomes a bludgeon. Tellingly, the novel ends with Papravel's hostile takeover of theb us company that hired his crew of bruisers: "I don't care what anybody says, America is a wonderful country," he gloats. "Look howI worked myself up in four short years.... Where, I want to know, where in the world could a Jew make such a man of himself as right here in America?" In Fuchs's scowling universe, only the unsuccessful are graceless, and fortune smiles only for the Papravels. Just as he has overtaken the bus line, the railroad company announces it will move only freight, sending its passengers to the buses on the roads. People did not live in dramatic situations? A book was anartificial synthesis, the product of a man's idea, to illustrate through his stress on characters and situations certain principles in which he was interested. Take Ripple Street ... and reproduce it faithfully and you would have a great formless mass of petty incident, the stale product of people who were concerned completely with the tremendous job of making a living so that tomorrow they would be able to make a living another day. Fuchs's creative choice--to deny any kind of resolution to a place where "poetry and heroism did not exist"--is deeply unsettling. The Philip Haymans with whom Fuchs grew up never saw beyond their bewildered despair, and Fuchs-- an apparent realist who may havebeen his contemporary Henry Roth's equal in modernist temperament--sacrificed the end of his novel, committing great cruelty to his characters, to drive home the bitter homiletical point. By Homage to Blenholt, the occasional hopefulness of Summer in Williamsburg (which sold four hundred copies, many bought byFuchs's colleagues at the Brighton Beach school where he taught) had curdled. We meet Max Balkan, another young tenement dreamer, this one seeking power and glory rather than wealth. "I don't want to be like everybody else," he tells his uncomprehending girlfriend Ruth. "It's dingy, dirty, small, and uncomfortable.... Living in a flat like this with a bathroom on top of you, going to a job all day and to the movies twice a week.... You're dead years before your time." Max has other aspirations: "Take King Arthur, Shakespeare. In all great classical works, what made them classics was the distinguishing characteristic of heroism and nobility....[Max] meant to look for heroism in his own life, to live with meaning and vigor." Max's lode star in this enterprise is a certain Blenholt, a slick neighborhood pol who, in his richly symbolic role as commissioner of sewers, made a livelihood of racketeering and graft. But Max is undeterred: "Let other people call him a gangster, but to me Blenholt was a kind of king, like the ancient Romans and Greeks, like the glorious Renaissance tyrants, powerful and crushing." In fact, Blenholt is pathetic, a diabetic who could not keep his handout of the sweets jar, which led to a premature death. Max, who is one of Fuchs's most formidable creations, contains enough aspiration to lift himself out of Williamsburg, but he has the worst of both worlds: Williamsburg's poverty of imagination and the scrambled priorities of Blenholt's universe. "A human being without money and influence," he cravenly thinks, "became ridiculous if he possessed only dignity instead." But Max idolizes Blenholt, because he has no one else to look up to. Ruth chides him for thinking himself special enough to make his own way. His mother mourns that, in her son's case, God appears to have ignored the Yom Kippur prayer for not-too-clever children. Max's father--who ran from the weekly paycheck to the Yiddish theater but now wears a clown outfit and carries an advertisement sandwich board--is perhaps the greatest betrayer of all: "He had always recognized the sorrowful destiny in store for his son.... Pain he felt for Max because he knew it would take his son time and suffering to resign himself." But "it was doubtful whether he could have permitted himself to ... reveal himself so nakedly to his son." Stranded in a conservative and insular environment, Mr. Balkan channels the values that his surroundings sanction, and represses the rest. And so his son vacillates between coarse ambition and crushing self-doubt. His back-and-forth with Ruth and his family is as larky as farce--one perceptive critic called the novel a comedy of manners--but, in its own way, their discouragement is as disheartening as the iconic violence of Albert Schearl, the Old World father of Henry Roth's Call It Sleep. Max's downfall--as with Cohen in the first novel, a startlingly harsh humiliation--begins at the Blenholt funeral. After Blenholt's goons threaten an elderly woman attempting to drive through the funeral procession, Max, fighting down feelings of meekness, attempts to mediate, only to be brushed aside. At the funeral itself, the shopkeepers who had been milked by Blenholt interrupt the oration, starting a melee that Max again unsuccessfully tries to resolve. This time he is viciously trampled, mainly because he isn't noticed. But at home he learns that an onion company has called about his idea to bottle onion juice. (His other brainstorms include a telephone service for movie showtimes, seat wrappers for public toilets, and canned orange juice--all of them visionary.) Again flush with enthusiasm, Max rushes to the meeting, only tolearn that the company has been bottling onion juice for years, but why don't you take this bag of onions as thanks for the effort. Heartbroken, Max gives in to a family proposal to go in on a delicatessen. His own father writes his obituary: "Max would never be the same again.... His son would grow old and, aging, die, but actually Max was dead already for now he would live for bread alone." And then Fuchs drives in the nail, with his final, diminishing line: "But all the same the evening sun that day went down on time." If, in Homage to Blenholt, Williamsburg was dingier, the parents more unreliable, and youthful aspiration even less likely to redeem, Low Company is nothing less than a kind of dystopia. Fuchs has moved the action to the invented Brooklyn waterfront neighborhood of Neptune Beach, though, as one critic has shrewdly observed, here "no one ever looks at the ocean." The characters--soda shop owner Louis Spitzbergen and a variety of employees and hangers-on--have so internalized the ghetto mentality that nobody is any longer a flight risk. Their Neptune Beach is mostly in the mind, though the physical environment is as grim as its predecessors: "Everything in Neptune Beach was sand. It was a misery. No matter how hard the street cleaners worked, shoveling the sand in mounds along the gutters, more blew in from the beach. On a rainy day you walked in black gritty mud. Nothing was solid, neither the pavements nor the foundations of the buildings." The place is crushingly sterile. Fuchs wants to show us what happens when the restraints--of income and of geography--lift, but without a concomitant rise in compassion. The grasping gets savage. The stingiest is Spitzbergen,who "always took great relish in operating the cash register whenever he could." Though wealthy, he is comfortable only when he imagines himself on the brink of financial disaster. The soda shop does well enough, but Spitz gets the bulk of his income from renting out several Neptune properties to a local heavy named Shubunka for use as brothels. Shubunka is hideous--"a huge face,his jaws like slabs of meat ... lumpy nose, and gross lips ... hisface on his short thick neck ... looking unnatural, like nothing human." Like Spitzbergen, he won't spare five dollars for a desperate horse-racing gambler and soda-shop regular named Karty,whose in-laws are pursuing him for $1,300 he has stolen to finance his betting. But Shubunka is about to have a comeuppance: a newly arrived, nameless syndicate is running him out of business. Shubunka turns abject and self-pitying, but Spitzbergen is heartless: where is his rent money?! Shubunka assures him that he will have it no matter his troubles, but Spitzbergen can think to express only skepticism. "The boys at Ann's [soda shop] ... have no room in their hearts for another," Shubunka laments to a neighborhood shopkeeper named Lurie. When the syndicate catches up with Shubunka, Lurie is there, watching transfixed as the gangster boys rough up the pimp. Shubunka's pleas to the thugs--"the fat man's frenzied outburst, the raw pleadings, the slobbering tears, a thorough exposure of a man's innermost emotions, repulsively naked and quivering"--elicit only disgust from Lurie. Shubunka's comedown--at last, the coming to pass of that ruin so feared by Spitzbergen--isa kind of relief, and frees the man to wallow in self-pity. But also to bare his need for another: at least Lurie was there to witness the beating, Shubunka thinks, at least I was not alone. Neptune's posturing is the desperate self-inflation of the frightened, reeling from the terror of life in the absence of brotherly love. Until Shubunka's outburst, though, no one is willing to admit it. Shubunka never quite transcends his self-love, but Lurie, who has been looking to marriage to take him away from the grimness of Neptune, learns a lesson: "Feeling with pity [Shubunka's] complete wretchedness, Lurie knew now that it had been insensible and inhuman for him, too, simply to hate Neptune.... He understood how their evil appeared in their impoverished dingy lives.... It was not enough to call them low and pass on." This is as close as Fuchscomes to redemption. The thugs continue after Shubunka, the in-lawsafter Karty. In desperation, the gambler sinks a wrench into Spitzbergen's face. The next morning, the rain breaks, the crowds return, and the shopkeepers of Neptune Beach have no time to dwell on the news of Spitzbergen's death: "It was too bad ... but after all, business was business." 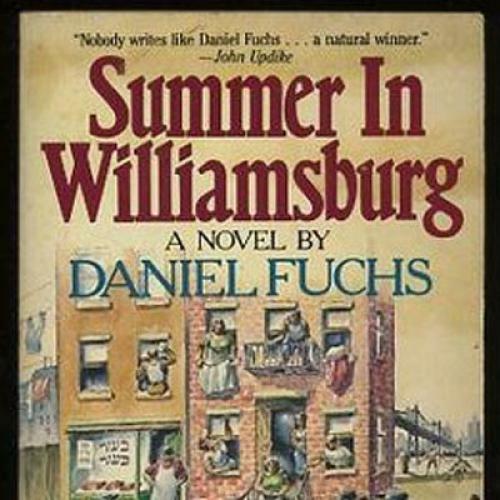 Summer in Williamsburg was published in the same year as Roth's Call It Sleep, another psychological--if more obviously imaginative and phantasmagoric--novel of life in the tenements. Both books, equally out of place in the early Depression years of politically compelled literature, were ignored. And both were re-issued in the 1960s, though this time only Fuchs would fail to gain wide notice. By then, he was contributor to a dozen noirish screenplays and an Oscar winner, for the James Cagney-Doris Day musical Love Me or Leave Me. In 1937, disheartened by the poor sales of his novels, he had "decided to become rich," breaking up a fourth novel into stories and making successful sales to The New Yorker, Collier's, and The Saturday Evening Post. Soon he was invited to Hollywood to turn one of them into a screenplay. And he more or less never looked back, committing the double sin of managing to leave the place that could never be left and finding contentment in the place where no self-respecting East Coast litterateur was supposed to remain. Surely Fuchs's reputation faltered because some of those litterateurs--who valued their talents much more seriously thanFuchs seems to have cherished his own--never forgave him his flight, and because he mostly stopped writing fiction. But more than anything, it was his own willingness to subordinate the appeal of his art to the idea of his stories. Fuchs was a master. He had Pasternak's wonder at youth's encounter with the wider world, and Chekhov's nose for thwarted desire, and Turgenev's generosity to the barbarians of the new world order. (Though his truest literary yichus is Dovid Bergelson, Yiddish literature's first modernist and its premier chronicler of the decline of the Russian shtetls. A little older than Fuchs, he too saw only ruins, his characters ensconced in a perpetual fog of uncertainty.) But Fuchs was so truthful a portraitist of Williamsburg's lassitude that his novels come to nothing. There are no revelations in these revelation stories. Almost no one is emotionally transformed. Nobody learns anything. Fuchs's fiction is, essentially, antidramatic. Such viciously comprehensive fatalism is hard to take, even when leavened by lovely writing; flawless character draftsmanship, mise-en-scene, and dialogue; and a precocious wisdom more befitting an old and lonely heart. It virtually turns the writer into an accomplice, his despair into sanguinity, his non-judgmental innocence an abdication not unlike the unanswering God whom Fuchs implicitly indicts. The reader wishes that Fuchs had at least showed his characters a brighter way, even if all of them failed to find it. But Fuchs, whowrote disapprovingly that "all authors knew everything because they were like God," refuses the crown. Like Philip Hayman, he cannot imagine life beyond the neighborhood walls. He, too, will make do with a cigarette and a window. But his own life proved that one could "pass on," indeed. And as Sam Tanenhaus perceptively noted in a review of the Hollywood writings, he had to leave: "Fuchs was just enough older [than the nextgeneration of Jewish- American writers] to feel hemmed in by Depression exigencies and to fear lifelong entrapment in the immigrant ghetto." So it was the ghetto's compulsions, not a sense of liberation, that sent him out West. Is a man compelled by freedom really free? Perhaps Fuchs sacrificed more than his art to make his literary point. Boris Fishman is writing a book about Russians, Jews, and America.